The Supreme Court heard challenges to the Aadhaar Programme for 38 days, the second longest hearing in Supreme Court history. The Aadhaar Act in its current form raises fear of State surveillance, privacy violations and denial of fundamental entitlements.With the conclusion of hearings, it is a good time to reflect on various concerns relating to Aadhaar and the possible implications of making Aadhaar compulsory in absence of a data security law. The Supreme Court unanimously declared privacy, dignity to be core fundamental rights in Puttaswamy case but the contours of these rights will be tested in the present Aadhaar case. 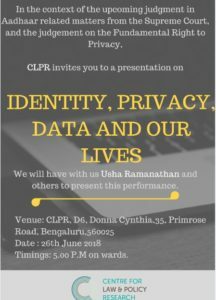 CLPR will host Ms. Usha Ramnathan, one of the most prominent voices against Aadhaar Programme. She will speak on “Identity, Privacy, Data and our lives”. Venue: Centre for Law and Policy Research (View Google Maps here). Timings: 5.00 P.M on wards.